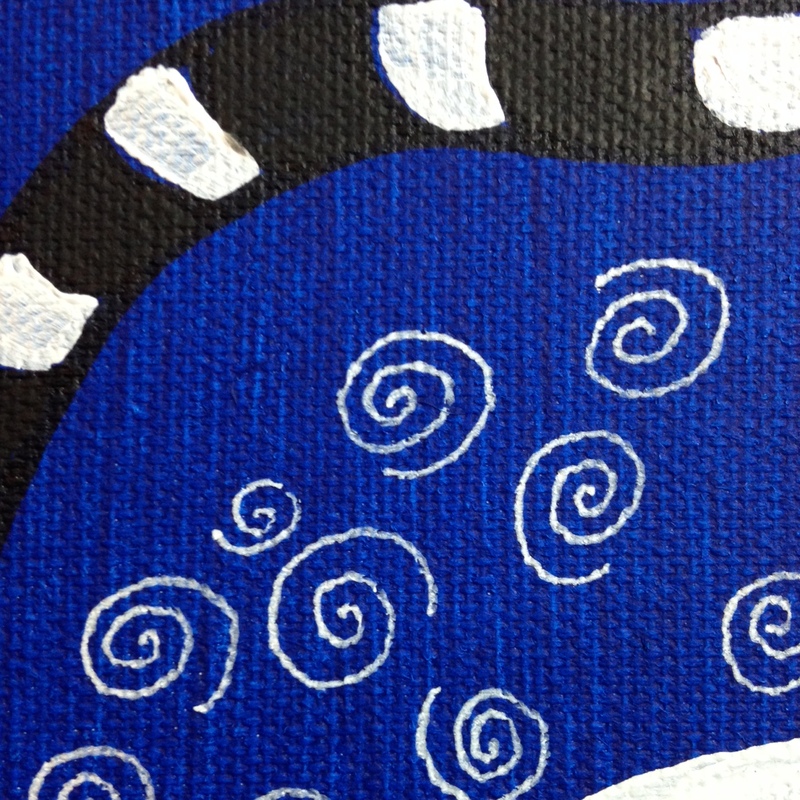 It’s Day 218 and I had a fun time painting today’s piece. Today’s artist is just lovely. 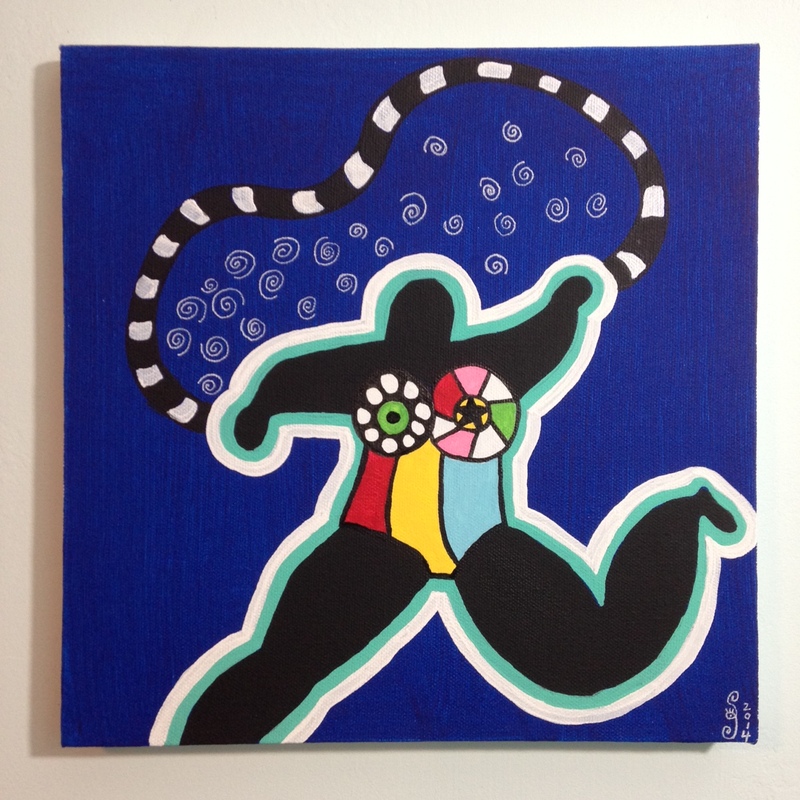 I have to do a few things before heading out to improv class so join me in honoring Niki De Saint Phalle today. 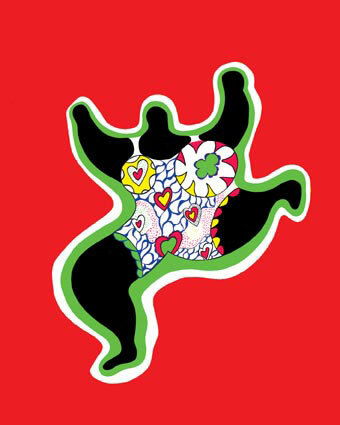 Niki de Saint Phalle, born Catherine-Marie-Agnès Fal de Saint Phalle (29 October 1930 – 21 May 2002) was a French sculptor, painter, and film maker. 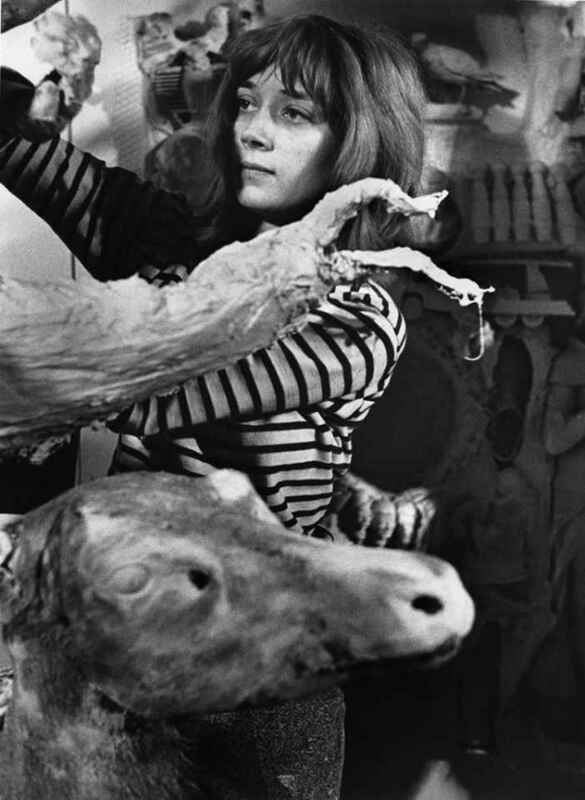 Niki de Saint Phalle was born in Neuilly-sur-Seine, Hauts-de-Seine, near Paris, to Count André-Marie Fal de Saint Phalle (1906–1967), a French banker, and his American wife, the former Jeanne Jacqueline Harper (1908–1980). She had four siblings, and a double first cousin was French novelist Thérèse de Saint Phalle (Baroness Jehan de Drouas). the United States in 1933, where her father worked as manager of the American branch of the Saint Phalle family’s bank. Saint Phalle enrolled at the prestigious Brearley School in New York City, but she was dismissed for painting fig leaves red on the school’s statuary. She went on to attend Oldfields School in Glencoe, Maryland where she graduated in 1947. During her teenaged years, Saint Phalle was a fashion model; at the age of eighteen, she appeared on the cover of Life (26 September 1949), and, three years later, on the November 1952 cover of French Vogue. At eighteen, Saint Phalle eloped with author Harry Mathews, whom she had known since the age of twelve, and moved to Cambridge, Massachusetts. While her husband studied music at Harvard University, Saint Phalle began to paint, experimenting with different media and styles. Their first child, Laura, was born in April 1951. Saint Phalle rejected the staid, conservative values of her family, which dictated domestic positions for wives and particular rules of conduct. Poet John Ashbery recalled that Saint Phalle’s artistic pursuits were rejected by members of Saint Phalle clan: her uncle “French banker Count Alexandre de Saint-Phalle, … reportedly takes a dim view of her artistic activities,” Ashbery observed. However, after marrying young and becoming a mother, she found herself living the same bourgeois lifestyle that she had attempted to reject; the internal conflict caused her to suffer a nervous breakdown. 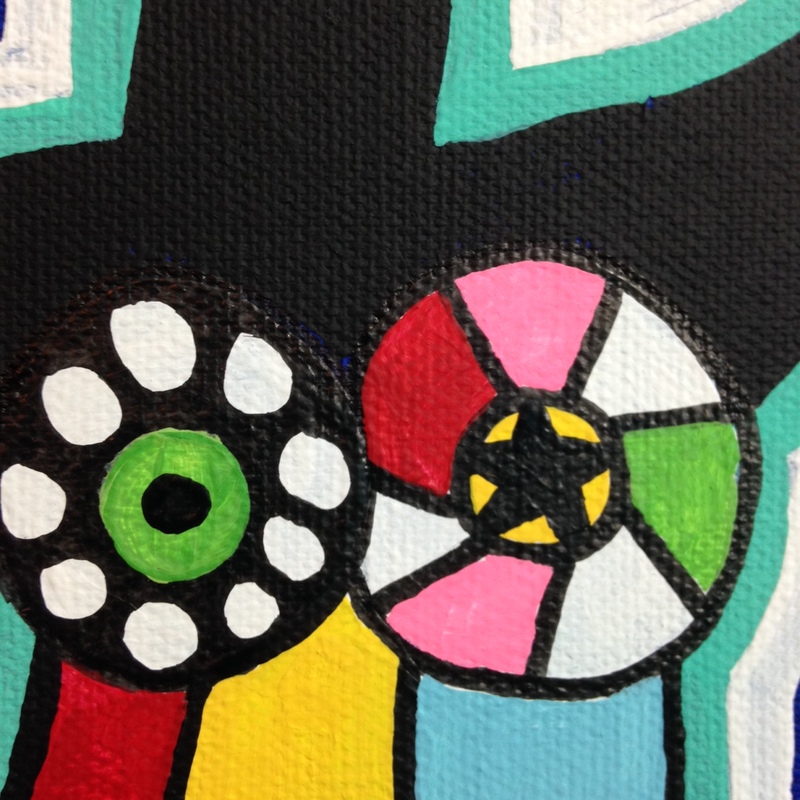 As a form of therapy, she was urged to pursue her painting. painter Hugh Weiss, who became both her friend and mentor. 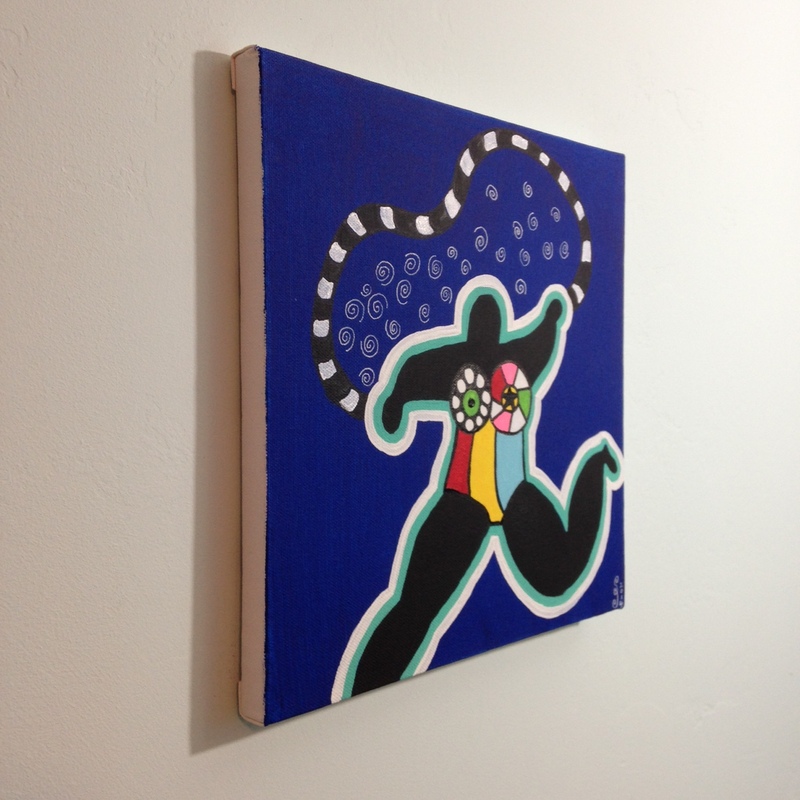 He encouraged her to continue painting in her self-taught style. She subsequently moved to Deià, Majorca, Spain, where her son, Philip, was born in May 1955. While in Spain, Saint Phalle read the works of Proust and visited Madrid and Barcelona, where she became deeply affected by the work of Antonio Gaudí. Gaudí’s influence opened many previously unimagined possibilities for Saint Phalle, especially with regard to the use of unusual materials and objets-trouvés as structural elements in sculpture and architecture. Saint Phalle was particularly struck by Gaudí’s “Park Güell” which persuaded her to create one day her own garden-based artwork that would combine both artistic and natural elements. Saint Phalle continued to paint, particularly after she and her family moved to Paris in the mid-1950s. Her first art exhibition was held in 1956 in Switzerland, where she displayed her naïve style of oil painting. She then took up collage work that often featured images of the instruments of violence, such as guns and knives. In the late 1950s, Saint Phalle was ill with hyperthyroidism which was eventually treated by an operation in 1958. Sometime during the early 1960s, she left her first husband. 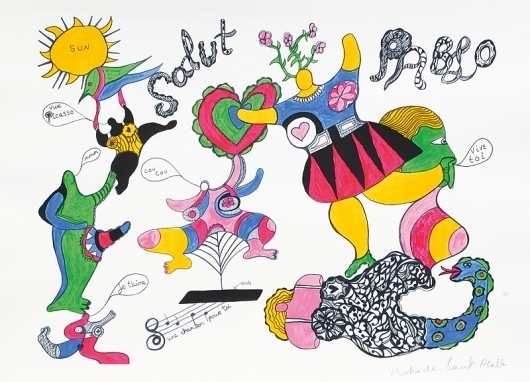 Niki de Saint Phalle created “Shooting Paintings” in the early 1960s. These pieces of art were polythene bags of paints in human forms covered in white plaster. The piece were shot at to open the bags of paint to create the image. After the “Shooting paintings” came a period when she explored the various roles of women. She made life size dolls of women, such as brides and mothers giving birth. They were primarily made of plaster over a wire framework and plastic toys, then painted all white. Inspired by the pregnancy of her friend Clarice Price, the wife of American artist Larry Rivers, she began to use her artwork to consider archetypal female figures in relation to her thinking on the position of women in society. 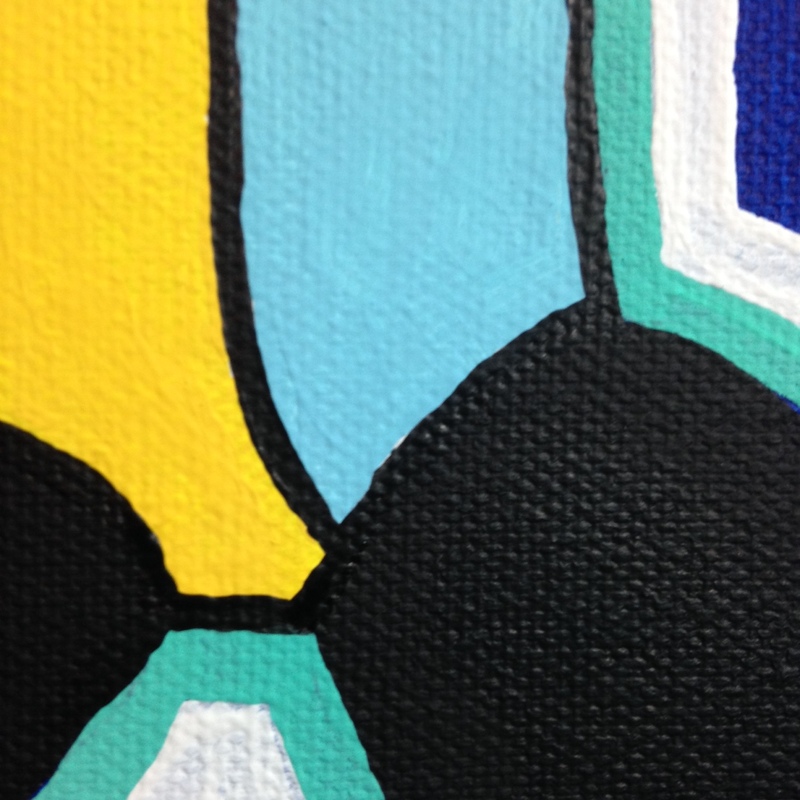 Her artistic expression of the proverbial everywoman were named ‘Nanas’. The first of these freely posed forms—made of papier-mâché, yarn, and cloth—were exhibited at the Alexander Iolas Gallery in Paris in September 1965. For this show, Iolas published her first artist book that includes her handwritten words in combination with her drawings of ‘Bananas’. Encouraged by Iolas, she started a highly productive output of graphic work that accompanied exhibitions that included posters, books, and writings. 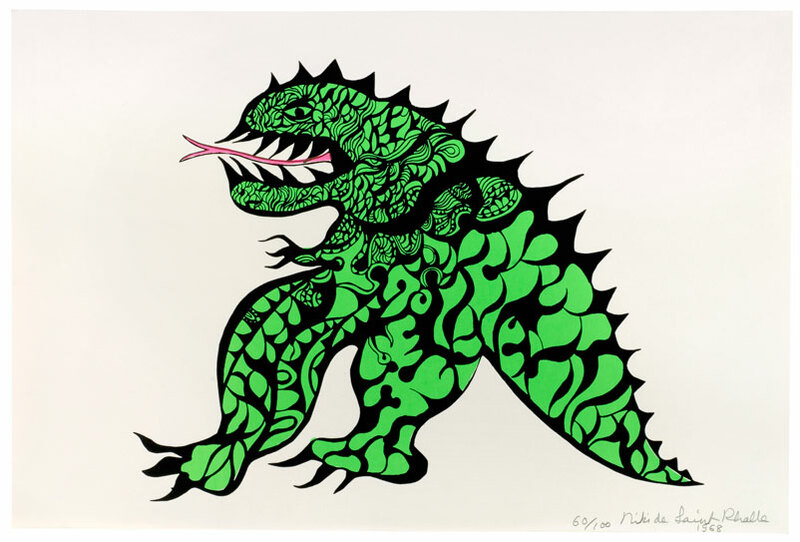 Niki de Saint Phalle, My Monster, 1968, © Niki de Saint Phalle/BUS 2012. In 1971, Saint Phalle and Tinguely married. 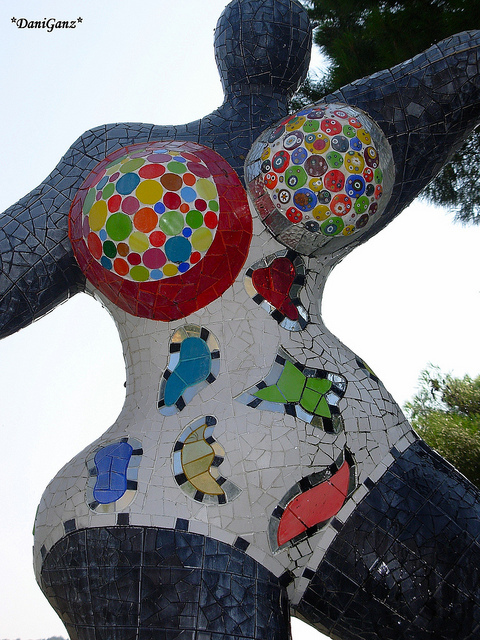 Influenced by Gaudí´s Parc Güell in Barcelona, and Parco dei Mostri in Bomarzo, as well as Palais Idéal by Ferdinand Cheval, and Watts Towers by Simon Rodia, Niki de Saint Phalle decided that she wanted to make something similar; a monumental sculpture park created by a woman. In 1979, she acquired some land in Garavicchio, Tuscany, about 100 km north-west of Rome along the coast. The garden, called Giardino dei Tarocchi in Italian, contains sculptures of the symbols found on Tarot cards. The garden took many years, and a considerable sum of money, to complete. It opened in 1998, after nearly 20 years of work. Her main benefactor of the period was the Agnelli family. Saint Phalle moved to California in 1994. On 17 November 2000 she became an honorary citizen of Hannover, Germany, and donated 300 pieces of her artwork to the Sprengel Museum. 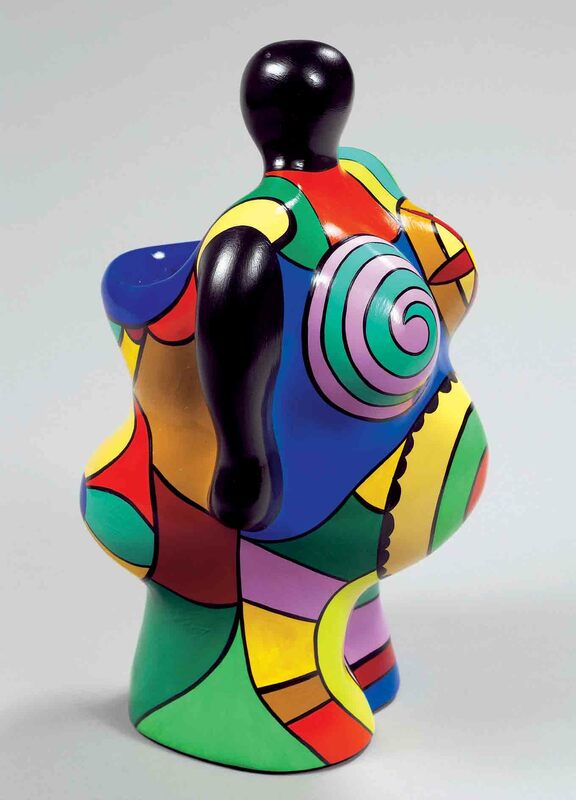 Niki de Saint Phalle died of emphysema in California on 21 May 2002.